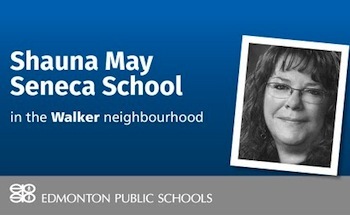 The Shauna May Seneca School will open in September 2017 in the Walker neighbourhood in southeast Edmonton. Shauna May Seneca was non-Aboriginal but her roots ran deep in Edmonton’s Indigenous community. It is this connection that prompted Edmonton Public School Board to name one of its nine new schools after one of the co-founders of Bent Arrow Traditional Healing Society. “Seneca worked to build community and foster diversity through the society that bases its work on traditional Aboriginal values and teachings,” wrote EPSB about the new Shauna May Seneca School, which will open its doors in September 2017. Shauna May Seneca was non-Aboriginal but her roots ran deep in Edmonton’s Indigenous community. It is this connection that prompted Edmonton Public School Board to name one of its nine new schools after one of the co-founders of Bent Arrow Traditional Healing Society. “Seneca worked to build community and foster diversity through the society that bases its work on traditional Aboriginal values and teachings,” wrote EPSB about the new Shauna May Seneca School, which will open its doors in September 2017. “My mother wasn’t a religious person. She certainly had her beliefs and she really identified with a lot of the beliefs and inspirational teachings and the Medicine Wheel of the Aboriginal culture. She really embraced their culture,” said David McNicoll, who was among nearly a dozen people who attended the June board meeting where EPSB announced the names of the new schools. Seneca was a social worker. Seneca and her husband Brad Seneca, who is Ojibway, created Bent Arrow Traditional Healing Society in 1994. They saw the need to close the gaps in services for Aboriginal children, who made up the majority of children taken into care by the province. The society started with a successful pre-employment program. The Senecas were then asked by Alberta’s child and family services department to open a group home. From there, the non-profit organization came to serve Edmonton’s Aboriginal population with a multitude of programs and services, such as referrals, family wellness and health programs, soup and bannock lunches, youth employment programs, family services, housing and financial services. “(Shauna) and Brad put it all on the line because they started something original and brand new here,” said Morgan-Redshaw. Both Morgan-Redshaw and McNicoll say Seneca would be honoured to have a school named after her. When the school does open next year, Morgan-Redshaw is hopeful that EPSB will continue to honour Seneca’s Aboriginal beliefs by having a smudging. McNicoll says it would be a “great aspect” if the school could incorporate Aboriginal teachings and culture and he has had informal discussions with EPSB. McNicoll says he would love to see a Bent Arrow program, such as Coyote Kids, offered from the Shauna May Seneca School, which will be located in the Walker area, south of Ellerslie Road. Seneca passed away in 2006 from a blood clot following knee surgery. She was 49 years old. Also honoured at the same time as Seneca with schools named after them by the EPSB are former Edmonton mayor Jan Riemer, former provincial premier Don Getty, and slain Edmonton Police Service Const. Daniel Woodall.